Soil tillage is one of the most common management practices in any crop production systems. Tilling can lead to increased yields, but also has some risks. The first is the increased risk for wind and water erosion. The second is the acceleration of oxidation of organic matter in the soil. The third is the risk of compacting the subsoil just below the depth of tillage. 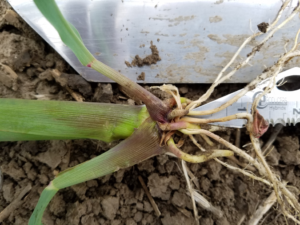 The last risk can lead to a fluffy soil and that in turn can lead to a problem called Rootless Corn Syndrome. Sometimes seeds are planted in dry, loose, fluffy soil. When the weather turns wet, the rains compress the soil, causing the nodal roots to form closer to the soil surface than normal. This, along with fluctuating environmental conditions that have occurred through most of the growing season, can cause the nodal roots to cease normal growth. If nodal roots fail to form, affected corn plants depend on the seminal roots and mesocotyl for nourishment, and the seminal roots become the primary anchor for the corn plant. Without the nodal roots, the corn plants do not have much of an 'anchor' to help them stay upright. This is when we see floppy corn that is easily blown over by the wind. 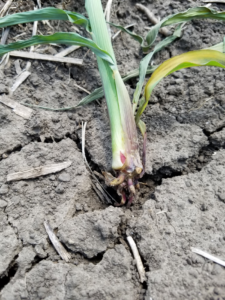 Another cause of rootless corn is shallow-planted corn, which places the crown close to the soil surface, causing nodal root development near the soil surface rather than its usual depth of around three centimeters.